Turning a house into your home is an exciting yet challenging process. If you're looking to improve your home with a remodeling project, Starcom Design/Build is here to help with expert design and high quality construction. We provide all types of home remodeling services, including kitchens, bathrooms, additions basements, garage conversions, and more. No matter what you're looking for, we can help you develop the perfect solution and provide you with a space you'll enjoy for years to come. If you want to upgrade your home with custom remodeling services, call us today at 1-855-230-3690 or contact us online to get started. We offer free estimates on all our services in Silver Spring, Columbia, Rockville and the surrounding areas. 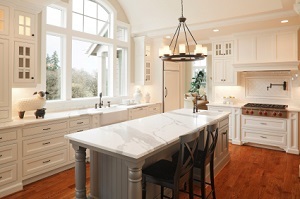 Kitchens are among the most popular remodeling projects, and for good reason. A kitchen with old appliances, outdated design styles, or an impractical layout is a problem for any homeowner. Our kitchen remodeling services include appliances, countertops, sinks, flooring, and everything else you need to transform your space into the kitchen of your dreams. Another common remodeling venture is bathrooms, which are among the most important factors in home value. Our bathroom remodeling experts will help you choose the right fixtures, design layout, tile, and vanity for your home, whether it's for a small powder room or the master bath. Building an addition is one of the best ways to increase a home's living space and property value. Additions can include new rooms on the main floor, in-law apartments, bonus rooms over garages, or entire second floors. No matter what you want in your home, Starcom Design/Build has you covered. Sunrooms are a great choice for homeowners who value energy efficiency and want to be more connected to the outdoors. Sunroom additions can be designed as open porches, three season, or four season rooms. Sunrooms are always a great space for relaxing with family or entertaining friends. For many homeowners, converting an attic or garage is the best method of adding living space. This eliminates the need to build an entirely new space, instead choosing to maximize the area you already have. We will ensure that your remodeling space meets all code requirements of living space, allowing you to choose the perfect garage conversion plan for your needs. If you've been wanting to improve your home, don't wait any longer! The experts at Starcom Design/Build will give you the perfect solution for all your remodeling needs, creating a great living space and improving the comfort and function of your home. Call us today at 1-855-230-3690 or contact us online to get a free estimate on all our remodeling services. We proudly serve in Columbia, Silver Spring, Rockville, Glen Burnie, Annapolis, Laurel, Ellicott City, Gaithersburg, Catonsville, Parkville and throughout the surrounding areas.